Well, the Bif Bang Pow! love fest keeps rolling on. As if a nod of approval from New York magazine wasn't enough, our Urban Achiever Vinyl Dude and Walter have just been featured in the July/August issue of Death + Taxes magazine! 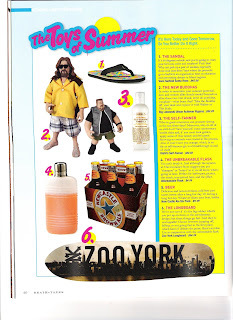 We're number 2 on their list of 'Toys of Summer', and once again we're in good company with an unbreakable flask and a six pack of Newcastle. Hmmm, wonder if they're trying to tell us something....Anyway, run out and get your copy and be like the rest of the cool kids. It's a great magazine, and obviously it's editors have exceptional taste.